Harrogate Nova member Geoff Morgan is taking on the ultimate Audax adventure in a few days time. Geoff, along with thousands of others, will attempt to complete the 1,200km Paris-Brest-Paris Randonneur. The PBP, as it is known, is one of the longest standing bicycle races, first being run in 1891 as a test of the practicality of the bicycle. 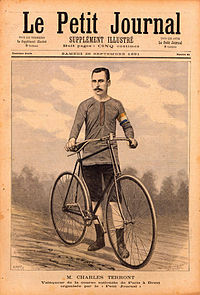 Charles Terront won the inaugural event, cycling for 71 hours and 22 minutes without sleep. Now held every four years, the event attracts thousands of cyclists from all over the world trying to complete the epic distance within the 90 hour time limit. Along with all other competitors, Geoff has had to complete four events of 200, 300, 400 and 600km to qualify for entry. 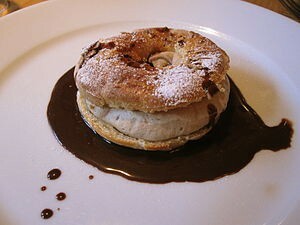 For the culinary aficionados, the event also gives its name to a dessert – the Paris-Brest – a choux pastry filled with praline flavoured cream. Created in 1910 to commemorate the PBP event, the wheel-shaped treat became popular with riders because of its energising high-calorific value. Good luck in your adventure Geoff . The event runs from 16th to 20th August – you can follow Geoff’s progress via the PBP website. Event 13 of the Evening TT League took riders to the seven and a half mile circuit of Arkendale Lane End-Marton-Aldborough-Boroughbridge. With two laps of the undulating circuit to be completed, a well paced effort was required. In the ladies event, Jess Bacon, York Cycleworks, took her seventh win of the series with 36:05. Julie Patmore claimed a Ladies Vet League course record in second place with 39:49, with Emma Robinson taking third with 41:16. In the men’s event, with 2015 League Champion Duncan Mullier sitting out this round, there was fierce competition and the closest podium battle seen all season. Dylan Flesher, Prologue Race Team, came out on top, taking a second League win with a time of 33:33. Nova duo Simon Cave (33:39) and Dave Morris (33:46) took second and third respectively. Huw Spacey, Performance Coaching, just sneaked fourth place with 35:06 ahead of Simon Ketteringham in fifth with 35:11. Mike Hudson took top Vet-50 honours with an excellent 35:12 and Walter Wilkinson continued his dominance of the Vet-70 competition with a time of 37:45. Harry Wrightson had another good evening, knocking seven minutes off his previous course best to record a time of 41:50. In Open Time Trials, Richard Hamilton recorded 22:36 for the ten-mile Darlington CC event held on the T104 (Leeming-Sinderby-Leeming) course. Second-claim Nova member Jess Bacon took an excellent 8th place in the RTTC National Championship 25, clocking 1:04:40 for the E15/25 course in Essex. Richard Pennock took on the Prudential RideLondon-Surrey 100, completing the event in 4 hours and 40 minutes. After the torrential rain of 2014 from the tail end of hurricane Bertha, the third running of the event was bathed in sunshine as 25,000 riders set off from the Olympic stadium in Stratford, east London, before tackling the classic Surrey climbs of Leith Hill and Box Hill, returning to London to finish on the Mall.